What we design now defines who we are and who we are becoming. Even as we respect our ancestry and reckon with our history, there is more possible than the trajectory that tradition dictates. From infinite clouds of probabilities, intention can manifest what we consider necessary or deem extraordinary. How we nurture what matters, balances our integrity with our interactions in the world. The inviolate moral, ethical, and spiritual principles we design together lead us to determine what is for the highest good; what will honor the individual and the collective, the transitory and the eternal, the beautiful and the true. No longer can we separate ourselves and our endeavors from their impact on the greater whole. To dispel this disabling illusion, we must open our hearts wider and feel more deeply than sympathy and empathy—until we embrace compassion, the state of knowing that we are one and the same. When we are conscious of our commonality we create responsibly, act accountably, and co-evolve respectfully. We understand that we exist only in relationship. And from this sacred place compassion is born. When we care—we commit. We become aware and aligned with concerns and causes that answer yes to life’s promise. Here we are, poised at this precious and precarious point in our planetary existence. 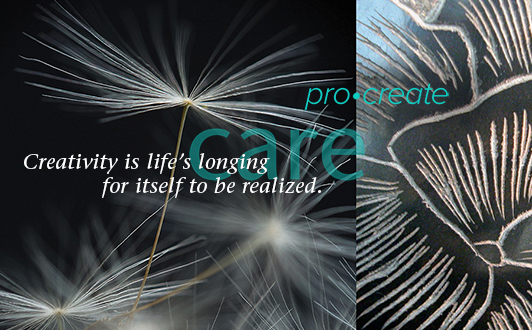 Will we conceive of new ways of being that care for a life-revering world for all species, across all time? Will this be our stand created out of wisdom, longing, and love? This entry was posted in Business, Creativity, Design, Evolutionary Potential, Humanity, The Great Transition, Transformation and tagged #BornToCreate, creativity, design, Lauralee Alben. Bookmark the permalink. Both comments and trackbacks are currently closed.